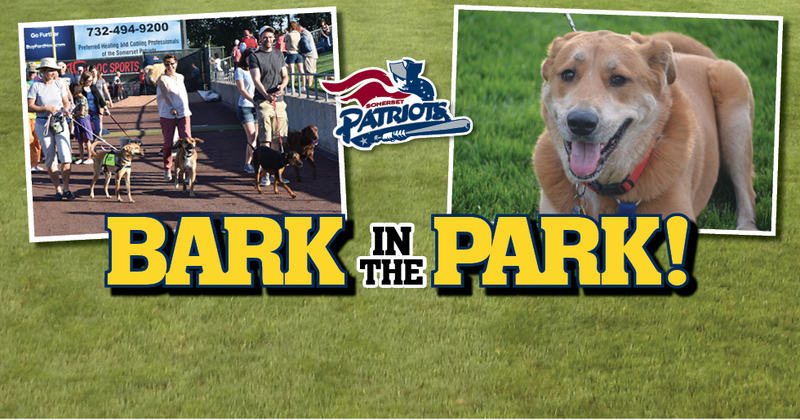 The Somerset Patriots will host three Bark in the Park Nights during the 2019 season. Fans can receive $5.00 Upper Box Tickets for the games by using the Promo Code: Woof when purchasing tickets on-line. All pet owners attending the game with their dog are asked to bring paperwork displaying proof of vaccination and their dog ID tag to be checked before entry outside the main gate. All dogs attending the game with their owners do not need a ticket for entry. Click Here For Bark In The Park Waiver! Pre-Game Pooch Parade beginning at 6:30pm. All interested dog owners should report to the lawn seating area down the right field line to participate. All owners and their dogs are encouraged to participate in the parade. Fans are encouraged to visit the concourse table displays during the game to collect free giveaways, information, and dog-related advice from various Patriots partners. Yappy Hour will take place in the 3rd inning at the Handlebar behind section 214. Bring your dog up for some delicious ice cream treats specially made for dogs. Fans are asked to only bring well-behaved, social and leashed dogs to the ballpark. The Patriots will provide bowls of water for the dogs throughout the concourse area.